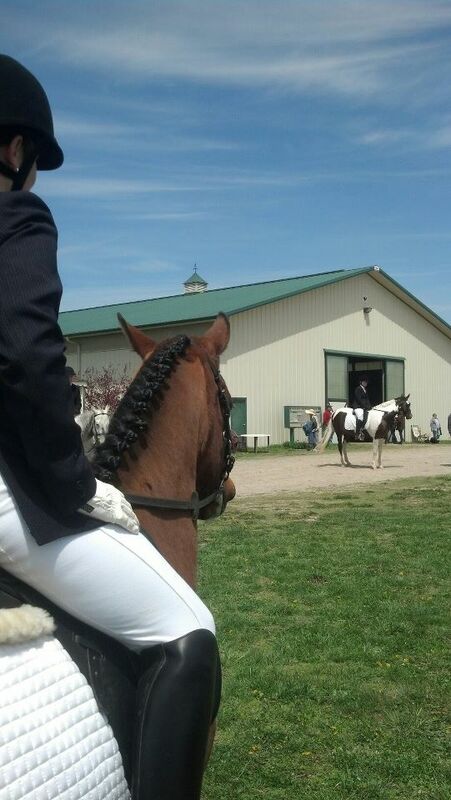 Dressage shows are broken up into classes, which are then judged according to a test. A sample “prize list” is to the right. A prize list is a list of all the classes offered in any given show. Each class has a different test, and the tests are based on the level of training the rider and the horse have completed. For example, Savy is only 4 years old and has just been started in her training so we entered in classes Introductory Level – Test A and Introductory Level – Test B. 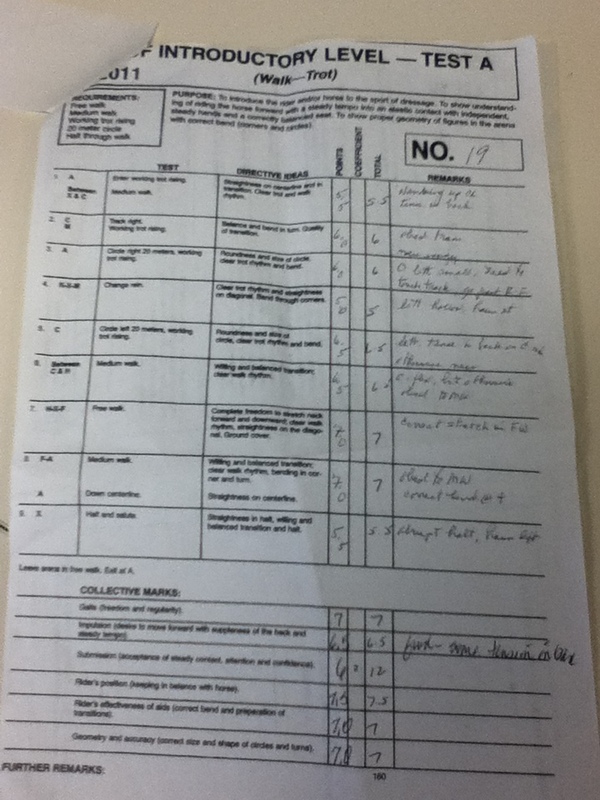 These are the very easiest dressage tests, and they’re for young horses, horses new to dressage, or beginner riders. 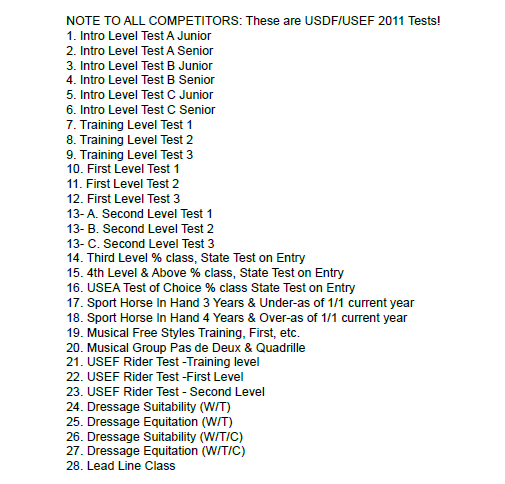 These tests only include the walk and trot. As the horse and rider complete more training, they can start to move “up the levels” of tests. So once Savy can comfortably canter and balance a rider on her back we can compete in the next level of competition. And once Savy and I learn the next movements we can move up another level in the tests. 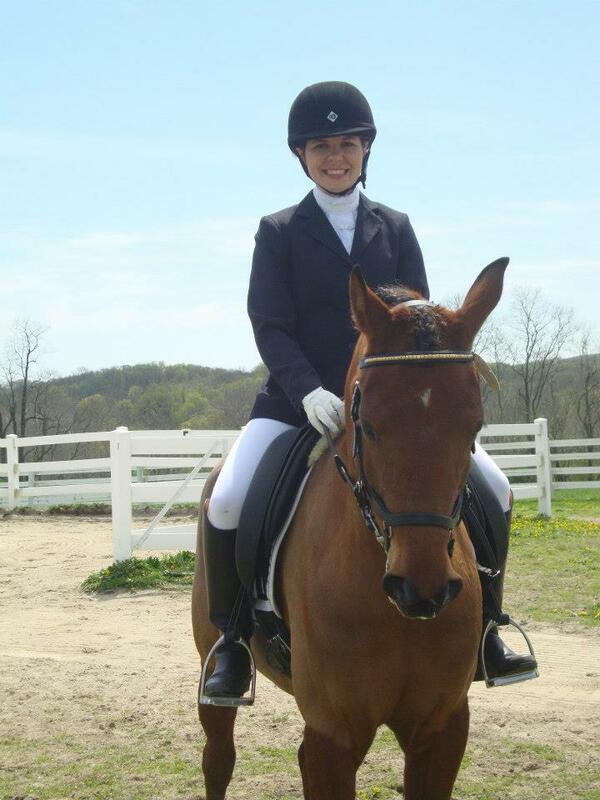 Dressage competition is really a training system that follows a linear progression. The lower levels teach the horses and riders skills they need to learn the more advanced levels. You can’t skip from one level to the next without learning the movements. The more advanced your training, the higher the level of competition in which you can compete. The lowest level is Intro (where Savy and I are) and the highest level is Grand Prix, which is the Olympic level. Still with me? The tests are a series of movements, like a pattern, that each person in the class completes and is judged on. The judge gives you a score on each movement based on a scale from 0-10. Your final score for the test is a percentage based on all of your individual scores. Anything in the 40’s and below is bad, 50’s is average, 60’s is decent, 70’s is good and anything over 80% is great. Most people score in the 60’s and 70’s. The judge also gives you comments explaining your score, which is nice. What I love about dressage is that you’re really just competing against yourself and trying to beat your score from the previous show. As I’m sure you can imagine, there’s a lot of preparation for a show. At least a month before a show I start pulling and banging (cutting) Savy’s mane, so that it’s ready to be braided. She has A LOT of mane so this process takes awhile, especially since she hates it. People always ask why horse’s manes are given such a short hair cut. There are several reasons. The manes are easier to maintain when they’re short, and it shows off the horse’s neck muscles. Neck muscles are an important thing in dressage. If the horse is carrying himself correctly, his muscles will have developed in certain places. So you can tell right away if a horse is being ridden correctly. Also, not every horse looks good with a long mane. Only certain breeds (like Andalusians, Frisians and Morgan) typically keep the manes long. These type of breeds have very thick, beautiful hair. Before you get in the show ring you have to warm up. The warm up ring can be a hectic place with nervous horses and riders going every which way. Savy hates the warm up ring. She gets very tense and pens her ears and sticks her chest out at each horse that comes near her. 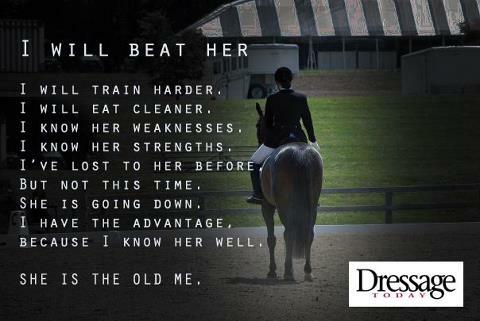 My goal for showing this year is to get used to the experience so she can go in a warm up arena and not panic. If I could actually get her to warm up calmly, I could focus more energy on our actual test. Once it’s your time to show, the judge will either ring a bell or blow a whistle and you have 45 seconds to enter the arena and start your test. Each test begins and ends with a halt and a salute to the judge. Once the test starts you cannot talk to anyone outside the arena and they can’t talk to you, with the exception of the test caller (are you listening Clay!). The rider is allowed to have someone call out the test during the show. And then it’s over. All you have left to do is wait for your score and the class results and hope that you placed. This is my text from the Walnut Creek show. Next to each movement there’s a score and an explaination.